I am a longtime Beatles collector, of rare promotional 45's. LP's, EP's and related items. I only ever bought the best quality pieces. 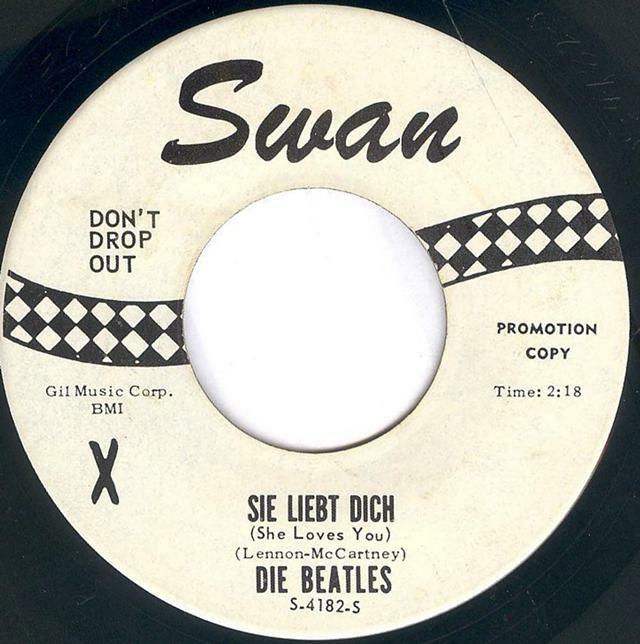 I have a very rare promotional 45 of The Beatles "Sie Liebt Dich" on the Swam label. This particular version is the "hardest" to obtain. It is on the glossy white label with the factory printed "X" on the A-side, and it simulates handwriting. "PROMOTION COPY" is printed on the right side of label on both sides. This original, special version issues were pressed by RCA. Rare thin print style on the fonts. The condition of the vinyl, you won't find any better. This copy I have, the vinyl looks like it has never been played. These are very rare, and to find one like this is just about impossible. I want $800 cash for it. However, I will consider and do a significant trade in vinyl LP's if you have what I buy. Psyche, Metal, Punk, Pink Floyd, Zeppelin, etc. However it would have to be a lot of LP's, even if they are common LP's as long as they are clean and the type I buy. I prefer to trade in a lot of vinyl records, as opposed to cash. Feel free to email me or call. Bo Burnham is coming to Houston, Texas on March 07, 2015!